In an effort to clean out magazines and cookbooklets, I've decided to join Magazine Mondays hosted by Cream Puffs in Venice. What I really like is that she isn't strict about when you post so I can publish these yummy results as I find them. If you are anything like me, you have a drawer or a box full of recipes from newspapers, magazines, old maiden aunts, grandmothers, friends and every potluck you ever went to and said I have to have that recipe! Now while I usually keep the combination of spices and seasonings somewhat intact, I do make changes that make it more palatable to my family. So I always keep a list of likes, dislikes and allergies and am constantly altering recipes to fly by the seat of my pants. These recipes have been floating around so long in the box of scraps that I have no idea where they originated (but they look like pages from an old Lawry's magazine when I worked there) which based on all my changes doesn't matter, but reminds me to keep that box. Some days I feel like an archaeologist, but come up with oldies that were favorites and will now be revived. Arrange pears side by side, center down in an un-greased 8x8 baking dish. Stir together the brown sugar and cinnamon. Sprinkle raisins around the pears. Evenly dot with the butter squares. 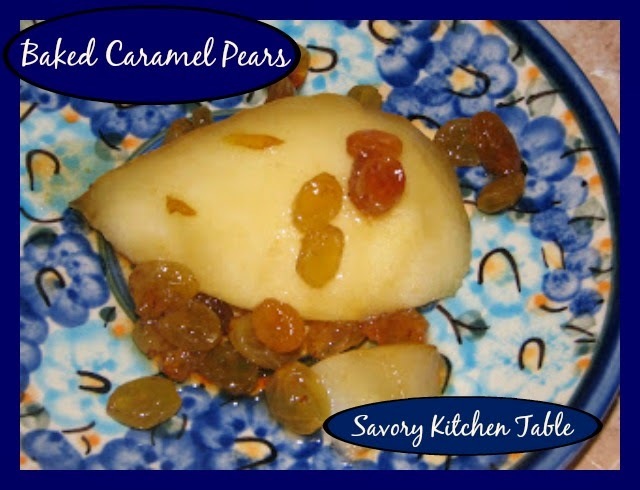 Bake uncovered 35-40 minutes or until pears are tender and brown sugar is bubbly. *I deleted the pecans and increased the brown sugar to 1/3 cup while adding the cinnamon also. **I soaked the raisins in rum for a day or so before and they were yummy! Next time I will maybe broil the pears for a couple of minutes after they come out of the oven to crystallize the sugar.